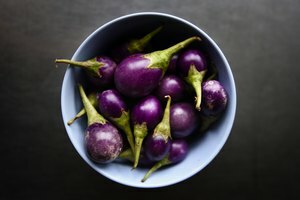 Boiling vegetables seems to has gone out of fashion, and the cooking method has never been a popular one when it comes to eggplants. 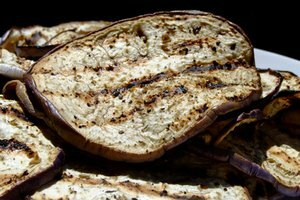 Most eggplant recipes call for roasting, baking, grilling or sauteing, but rarely boiling. When a recipe does tell you to boil eggplant, know that the task is very straightforward. 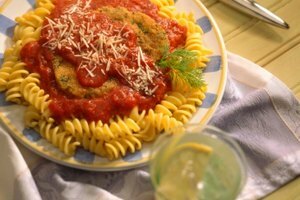 It also has some significant benefits that might have you reaching for a pan of water rather than turning on the oven or grill. Aside from being quick and easy, boiling is one of the healthiest ways to prepare eggplant, which is notorious for soaking up oil. You can boil eggplants whole, sliced or diced, and either peeled or unpeeled. Wash the eggplant first, and if you're boiling it whole, poke a few holes in the skin. Wait until you're ready to cook the eggplant to peel and cut it, as the flesh quickly discolors when cut. 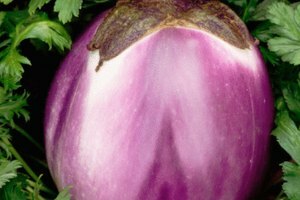 Peeling isn't necessary, but larger and older eggplants tend to have a thicker skin that can be unpleasant to eat. You can use a vegetable peeler or sharp knife for the task. Slice or dice the eggplant to any size pieces you prefer, but aim to keep all the slices or cubes similar in size for even cooking. Add enough water to a pan to fully cover the eggplant, and bring it to a boil. You can use plain water for boiling and season the eggplant after it's cooked and drained, or season the water with salt and optionally pepper, garlic, lemon juice or other herbs and spices. After you add the eggplant to the boiling water, adjust the heat to maintain a simmer. Test the eggplant's done-ness by poking it with a knife, and when it's done, remove it with tongs or a slotted spoon. Set the eggplant on paper towels or inside a colander to remove any excess water, and let it cool before handling. The timing for boiling eggplant depends on whether you want it to be fully cooked, par-cooked or blanched, as well as the size of the whole vegetable or pieces. Boil eggplant until it's fully cooked, and you can immediately add it to other dishes or turn it into a dip; par-cook eggplant and you can finish it by roasting, sauteing, baking or grilling with a shorter cooking time and reduced amount of oil. Or, blanch eggplant before freezing it for future use, a convenient option when your eggplant needs to be used but you're not ready to eat it. Whole, medium-sized globe eggplants should take approximately 20 minutes to be fully cooked but still slightly firm. Add 5 minutes or so for silky-soft flesh. Increase or reduce the time by a few minutes for larger or smaller eggplants. Thick slices or larger cubes should take about 10 minutes to fully cook, and thin slices and smaller cubes around 7 minutes. Halve these approximate times for par-cooked eggplant that you intend to finish cooking using another method. When you're blanching eggplant before freezing it, add lemon juice to the water to prevent discoloration. Add around 1/2 cup of lemon juice per gallon of water. Boil the eggplant, sliced or cubed, for 2 to 4 minutes, depending on the size of the pieces. Remove the eggplant pieces from the boiling water and immediately transfer them to the bowl of ice water, which prevents overcooking. Drain the eggplant pieces, dry them on paper towels and store them in the freezer in food bags or containers. Fully cooked boiled eggplant is ready to eat as-is. 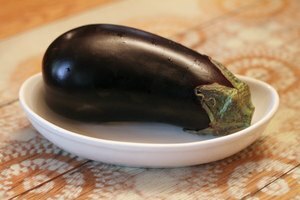 If you boiled the eggplant whole, slice off the stem, cut it in half and scrape the flesh from the skin, or slice or dice it with the skin still on. You can eat boiled eggplant cold with a dressing, add it to a salad, use it for a veggie omelet or add it to a stir-fry, curry or pasta sauce at the last minute. 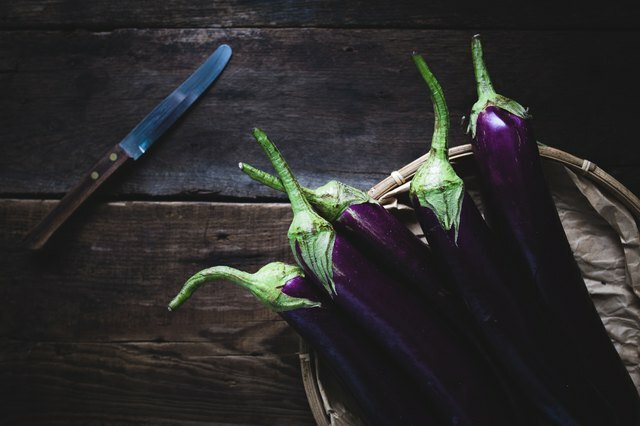 For a Mediterranean vibe, put cooked eggplant pieces inside a pita pocket with tzatziki, or blend it with garlic, lemon juice, tahini and olive oil for a quick baba ghanoush. How Long Does an Eggplant Stay Fresh?